Long before I started my own family research, there was one thing that I knew for certain: my Garceau line had a long history in Canada. After a great deal of research, I determined that my first ancestor to immigrate to Canada was a man named Jean Garceau, a French soldier who arrived at Port Royal, Annapolis County, Nova Scotia in the late seventeenth century. I found that I was a descendant of his son, Daniel, born at Port Royal in 1707. My research took an unexpected turn, however, when I found that many sources placed Daniel in Connecticut and then New York in the 1750s. Why was Daniel in America? It was then that I learned of an event known as ‘The Great Expulsion,’ which was the forced removal of 11,500 French settlers, known as Acadians. The term Acadian arose because the lands of present-day Nova Scotia, New Brunswick, Prince Edward Island, and parts of Quebec were known as Acadie. Daniel, his wife, and his eight children were expelled on the ship Experiment and were left in Connecticut before making their way to New York. I sincerely promise and swear by the Christian faith that I will be completely faithful and truly obey His Majesty the King George the Second, who I acknowledge to be the Sovereign Lord of Nova Scotia or Acadia. So God help me. Acadian neutrality was not long-lasting. 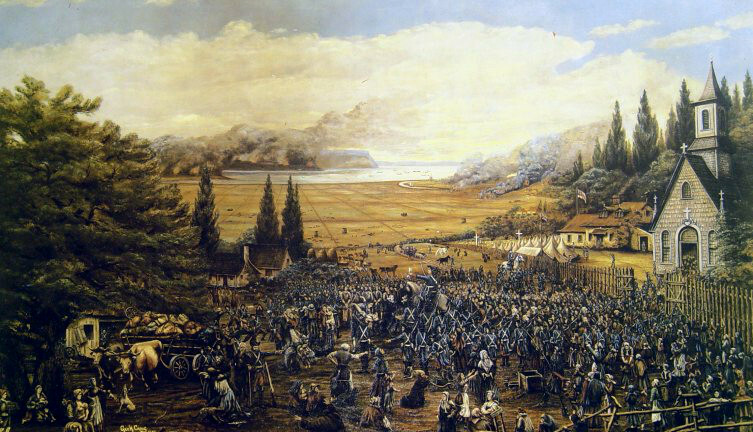 During the French and Indian War, the British viewed the Acadians and their allegiance to the French as a major threat. The 1755 Bay of Fundy Campaign resulted in the beginning of the expulsion of Acadians by the British. After much resistance and many attempts to avoid expulsion, nearly 11,500 Acadians were driven out of Nova Scotia. The Acadians were sent to North American coastal colonies, where they formed small, impoverished Catholic communities. Three thousand five hundred Acadians were deported to France as well, making it the destination with the highest number of exiles. After living in the homes forced upon them by the British for years, or even decades, many Acadians returned to Canada, with some settling in Quebec, forming the large French Canadian population that exists there today. Many more returned to other Canadian maritime provinces such as New Brunswick. Others remained in their newly-established homes. By 1800, more than 4,000 Acadians had settled in Southwestern Louisiana, forming the basis for the modern Cajun population. More than 12 years after being expelled from Nova Scotia, Daniel Garceau returned to Canada, this time settling at Yamachiche, Quebec. While Daniel’s time in America was relatively brief, it still formed a pivotal part of my family’s narrative. 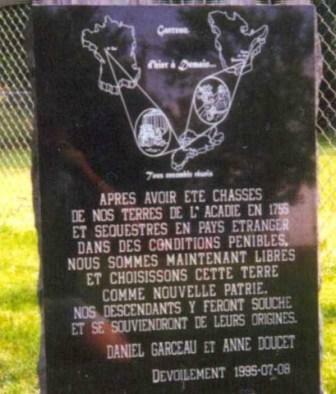 Today, a monument stands at Yamachiche dedicated to Daniel Garceau and his wife, Anne Doucet, which commemorates their expulsion and return to Canada. François Pierre Sévère Lesieur Desaulniers, Les vieilles familles d’Yanmachiche (Montréal: C.O. Beauchemin & Fils, 1898-1908), p. 42. Map of Acadia, courtesy of British Battles, http://www.britishbattles.com/french-indian/braddock-monongahela-part-1.htm. Acadians in New York, http://www.acadian-home.org/acadians-new-york.html. Geoffrey Plank, An Unsettled Conquest: The British Campaign Against the Peoples of Acadia (Philadelphia: University of Pennsylvania Press, 2003), p. 91. Public Archives of Canada, Report, vol. 2 (Ottawa: Maclean, Roger & Company, 1906), pp. 74-75. Richard Patrick Carstens, The Republic of Canada Almost (Bloomington, Ind. : Xlibris Corporation, 2013), p. 270. Elliott Robert Barkan, Immigrants in American History: Arrival, Adaptation, and Integration (Santa Barbara, Calif.: ABC-CLIO, 2013). John Mack Faragher, A Great and Noble Scheme: The Tragic Story of the Expulsion of the French Acadians from Their American Homeland (New York: W.W. Norton and Co., 2006). Desaulniers, Les vieilles familles d’Yanmachiche, p. 42. Famille Garceau Website [see Note 1]. I truly appreciate your very well researched, documented, and interestingly written story of your family. I love how you placed everything in the context of their lives within their culture and times. Quite interesting – previously unknown history to me. This is a coincidence as we were just talking about having to memorize the opening passage of Longfellow’s poem “Evangeline” in 8th grade. I found notes about Matthew LaRue, an ancestor probably French, 17th Century in the NL&D New England Gen Dictionary that showed he moved from the Kennebec River (Maine) area to Staten Island in late 1690’s. Do you know of any old sources to read up on this period in the French/English contested area? I thought he might be a French fur trapper, etc.? I would certainly recommend “A Great and Noble Scheme: The Tragic Story of the Expulsion of the French Acadians from Their American Homeland.” Seen here: https://books.google.com/books?id=6TgMAAAAQBAJ&pg=PA285&dq=Kennebec+River+Expulsion+Acadians&hl=en&sa=X&ved=0CDEQ6AEwAGoVChMIxb3n4-CUxgIViUyMCh2uGgBT#v=onepage&q&f=false . On page 285, they discuss an expedition to expel the French along the Kennebec River. Also, Francis Parkman’s “Works: A Half-Century of Conflict” has a good deal on the movement in that area: https://books.google.com/books?id=CjVHAQAAMAAJ&pg=PA384&dq=Kennebec+River+Expulsion+Acadians&hl=en&sa=X&ved=0CDcQ6AEwAWoVChMIxb3n4-CUxgIViUyMCh2uGgBT#v=onepage&q&f=false . In reading Faragher and other historical accounts —-one must differentiate the English in London from the English in Boston — those descendants of the Puritan Oligarchy who were the backbone behind the orders to expel these very innocent and neutral peoples from their homeland. As Catholics they like everyone that got in the way of the “Saints” —- whether Anglican, Abenaki or French neutrals had to be done away with — the Boston Puritans however were more sneaky and more insidious in the expulsion for they had to act quickly before London got wind of what they were doing. The Queen has graciously apologized for this in behalf of London but I really think that it is time that the descendants of the Boston Dons’ —starting with Governor Shirley … own up to their malfeasance and apologize as well ! I was lucky enough to have spent 6 years in the Orleans Parish, Louisiana schools, 4 in elementary & 2 in high school. We learned a lot about this sad tragic episode in 3rd & 4th grades especially. In 10th grade I had a Cajun French teacher; the following year my French teacher was Parisian, & it was hard for us to understand each other! In a lot of ways, Louisiana is a whole other country, but truly fascinating! Thank you for such a clear and heartfelt introduction to a difficult subject. Like you, until I started to research my French-Canadian family, I had little knowledge of their lives. For my family, It has been a fascinating and sometimes painful journey as we uncover tragedies and triumphs. For those of us whose families immigrated to the United States, we may find ancestors on both sides of the conflicts of this era. I too am a Garceau descendant–Daniel’s younger brother Joseph–but while studying The Expulsion, came across the name of my 7th great-uncle Jeremiah Bancroft, 1725-1757, An ensign in the forces led by John Winslow, sent to quell and remove the Acadians, Jeremiah left a sober view of the events in his diary. Recently, a transcript of that journal has been republished giving us valuable insight– http://www.acadian-home.org/Fowler_Lockerby_Bancroft.pdf. Thank you for sharing your ancestral history. I have a distant in-law whose ancestors were early Quebecois, but relocated to Louisiana, never to return to Canada. On the other side, some of my ancestors benefitted from your loss, by moving to Nova Scotia immediately after the end of the French and Indian War from their homes in Massachusetts. Thank you for sharing your family’s history. I get very frustrated when people assume the only French Canadians are from Quebec. My grandfather was born and raised in Arichat on Isle Madame, a French enclave off the SE coast of Cape Breton. Thank you Zack for sharing this story which is part of the history of so many families in New England, Louisiana and other parts of the country. My own ancestors had settled on Ile St. Jean (Prince Edward Island) by the time of the expulsion. They were able to avoid capture and deportation and many of their descendants still live on PEI and in New Brunswick. my high school and college (1-yr) of French is failing me. Would you translate what the monument says? My husband’s ancestors include some of the “loyal New Englanders” invited up to Nova Scotia to take advantage of the already cleared lands which had been in French hands. John Victor Duncanson wrote two books Falmouth–a New England township in Nova Scotia, 1760-1965 and Newport, Nova Scotia, a Rhode Island township, documenting those families. Mara I always find this so ironical….. the Boston Dons under the guise of Governor Shirley cleared the Acadia land of the French neutrals in order for it to be resettled by their fellow New England Puritans. However when the more reasonable bunch in their loyalty to the King and Church decided to buck the Saints and having no choice but to leave —-often under the cloak of night —found refuge in these lands and with it cemented Canada’s strong British identity ! Hence the very few “loyal New Englanders” that took advantage of the same land became themselves British subjects and subjects of the same Crown that they had just fought against ! Hi Zach–my daughter is a Garceau born in Malden, Massachusetts in 1974. Her father’s family lived in Saugus, MA. The family names fit very much with the early Garceau history, which I am trying to learn about. Her grandfather was Francis, her uncle was Daniel and her aunt was Diane. My exhusband said that his family originated from Canada,but he didn’t know when or from where. I suspected it was during the Acadian diaspora. I think this Garceau family is directly descended from Pierre Garceau his son Jean (Tranchmontagne) Garceau, and his son Daniel. There are soooo many Garceau’s, however, it’s hard to track which line they came from. Any information that you or your reader’s have would be greatly appreciated.